These are interesting times for British film comedy. Last year Chris Morris’ suicide bomber farce Four Lions presented an intelligent reflection on a thorny problem, while earlier this year Richard Ayoade’s Submarine proved that British comedy could tackle peculiar and poignant as well as the best American independents. Now Joe Cornish, half of cult TV and radio duo Adam and Joe, makes his writing and directing debut with Attack The Block, a joyously exciting action sci-fi that imagines the outcome when a bunch of vengeful extra-terrestrials face off against a gang of teenage hoodies in an inner-city London tower block. There are laughs on hand, but Cornish also has a serious point to make about his protagonists’ exclusion from society, particularly in the character of Moses, the gang’s hotheaded leader, played by newcomer John Boyega. Moses is the kind of character that has become shorthand in recent British cinema for pure evil, thanks to a spate of ‘hoodie horrors’, including the Michael Caine revenge flick Harry Brown and Paul Andrew Williams’s Cherry Tree Lane. It’s a perspective that Cornish hopes to counter with Attack The Block. Cornish’s upbeat and engaging manner – familiar from the weekly 6 Music radio show in which he and co-host Adam Buxton frequently collapse in fits of giggles – conveys his positivity about humanity, which is both infectious and very welcome in the often bleak world of UK film. It’s an outlook he shares with his filmmaker friend Edgar Wright, and it is what enabled him to see the potential for science fiction storytelling in these unlikely characters and settings, just as Wright did for zombies in Shaun of the Dead. 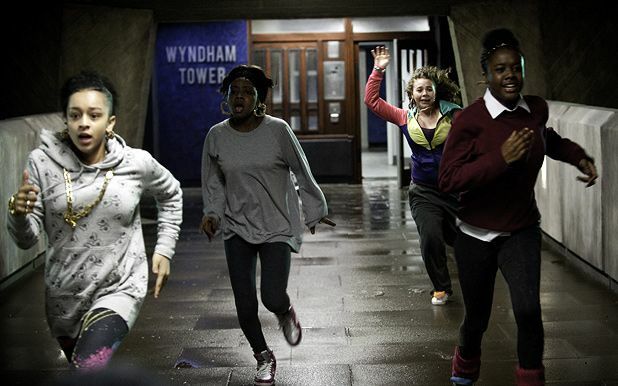 Attack The Block, general release from Fri 13 May.